We are pleased to invite you to a Distinguished Public Lecture hosted by Monash Asia Institute (MAI) in collaboration with Monash University’s Office of Global Engagement. 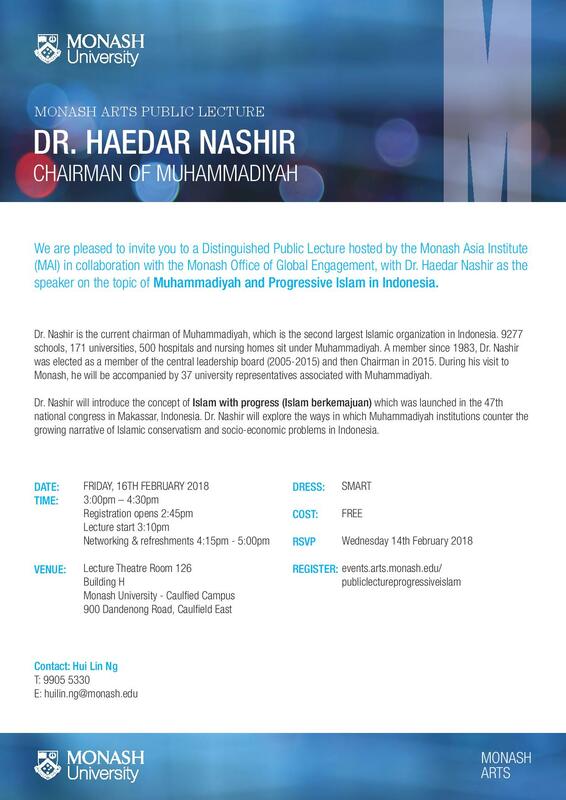 The lecture will feature Dr. Haedar Nashir, Chairman of Muhammadiyah speaking on ‘Muhammadiyah and Progressive Islam in Indonesia’. Muhammadiyah is the second largest Islamic organisation in Indonesia. 9277 schools, 171 universities, 500 hospitals and nursing homes sit under Muhammadiyah. A member since 1983, Dr. Nashir was elected as a member of the central leadership board (2005-2015) and then Chairman in 2015. During his visit to Monash, he will be accompanied by 37 university representatives associated with Muhammadiyah. Dr. Nashir will introduce the concept of ‘Islam with progress’ (Islam berkemajuan) launched in the 47th national congress in Makassar, Indonesia. Dr. Nashir will explore ways in which Muhammadiyah institutions counter the growing narrative of Islamic conservatism and socio-economic problems in Indonesia.